The story about the Florida man who was acquitted on child abuse charges last week for doing to a 7-year-old boy what had been done to him as punishment when he was a kid got me to thinking about the process of how people and communities change their individual or collective minds. Slavery was once a way of life world-wide. There was a time when few people thought twice about children laboring in factories. The U.S. is still coming to grips with developing a system that protects women from assault by their spouses, ex-spouses, boyfriends or former boyfriends, but at least there’s a collective agreement that abusing women is wrong. suffering — sometimes extreme trauma for months or years — before anyone outside a family may intervene. And we haven’t collectively accepted that it’s wrong to slap children across the face, spank them, hit them or shove them. The logic escapes me….we allow adults to do to children what is illegal for them to do to each other. Parents who spank often do so by default. Many, particularly those who were hit themselves, find that spanking is the only disciplinary tactic in their toolbox. Doctors are in a position to change that by educating parents about the stages of normal child development, recommending alternative ways to discipline and referring interested parents to appropriate resources and parenting classes. In Sweden, for example, new parents are hooked up with support groups and given information about developmental stages. Positive Discipline: What It Is and How to Do It, by Dr. Joan Durrant. You can download it for free. Positive Discipline for Preschoolers: For Their Early Years — Raising Children Who Are Responsible, Respectful, and Resourceful, by Jane Nelsen. That and other positive discipline books, workbooks and training CDs can be found at PositiveDiscipline.com. How to Talk So Kids Will Listen and Listen So Kids Will Talk, by Adele Faber and Elaine Mazlish. Efforts to ban corporal punishment of children are gaining ground world-wide. EndCorporalPunishment.org reports that 32 nations have banned corporal punishment in all settings, including the home, and 117 nations have banned hitting children in schools. But there are still 168 nations that still allow physical punishment in the home and 81 nations still allow schools to physically punish children. Effective Discipline (Stophitting.com), 19 states still allow teachers and principals to spank or hit schoolchildren. No state has banned physical punishment in the home. California and Massachusetts tried, but the measures were resoundingly defeated. 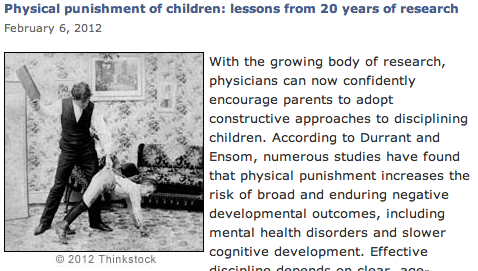 For more details, check out this review that Dr. Elizabeth Gershoff published in 2008: Report on Physical Punishment in the United States: What Research Tells Us About Its Effects on Children. Of course the ACE Study shows that emotional abuse is more detrimental than physical abuse, but one can only hope that by opening the door to banning physical abuse and embracing positive discipline that haranguing, berating, yelling at and denigrating children will also go by the wayside. In the early 1990s, I had the great good fortune to live in Bali for three years. One morning, my neighbor yelled at, then smacked his 7-year-old boy who was fussy and jet-lagged and didn’t want to get up to go to school. (With houses made of bamboo, it’s easy to hear everything that goes on.) The family had just returned from the U.S. on a 20-hour flight, and everyone’s time clocks were frayed. It wasn’t a knock-out punch. It was a hard slap, enough to sting, no doubt; the boy’s wail bespoke more of hurt feelings than physical pain. We found the dad later in the day sitting on a rock, looking horribly dejected, and eating a cucumber. Turns out, after packing his son off to school, he had gone straight to the doctor. The doctor gave him this prescription: eat cucumbers three times a day and lay off meat for a few weeks. Yes, cucumbers have estrogen and meats have androgens, but not enough to change behavior. But it was the mindset that was reinforced — the dad knew that his little boy was having a difficult time and needed help, patience, support, and comforting. But he, the adult, had lost control. His behavior was wrong, not his child’s. And the system was set up to help him…..immediately, without shame, blame or punishment. They’re Homo sapiens. We’re Homo sapiens. If they can do it, so can we. Great story Jane! If anyone would like free copies of the Report on Physical Punishment in the United States: What Research Tells Us ABout Its Effects on Children, and/or brochure for parents: Principles and Practices of Effective Discipline: Advice for Parents, please let email me at mstanto@phoenixhildrens.com Also if you would like to formally endorsement the Report, please let me know.